The Ralph Foster Museum at College of the Ozarks offers free admission during Area Appreciation dates, Jan. 28- Feb. 9, 2019. 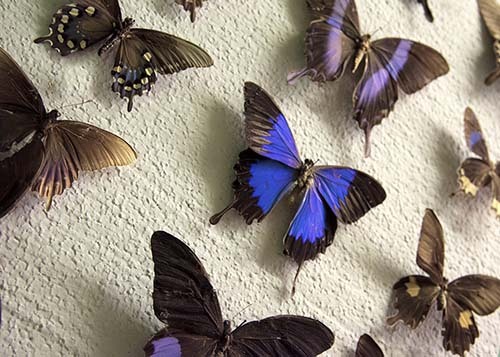 The museum features a unique display of butterflies, which is one of the oldest displays on site. POINT LOOKOUT, MO. — The Ralph Foster Museum at College of the Ozarks will offer free admission during Area Appreciation dates: Jan. 28- Feb. 9, 2019. The offer is available to those living in Stone and Taney Counties. The Museum is open to the public every Monday through Saturday from 9 a.m. to 5 p.m. Dedicated to the history of the Ozarks region and named in honor of radio pioneer and philanthropist Ralph D. Foster, the Ralph Foster Museum is a three-story gallery housing thousands of objects representing archaeology, history, firearms, antiques, natural history, fine arts, geology, and mineralogy. The museum also houses the Beverly Hillbillies car and has one of the Midwest’s finest firearms collections.